That is disappointing news. Thanks for sharing. I was interested in how the heart could possibly be causing a headache. I guess we have to wait until future studies are conducted. Thanks so much for posting this information. My neurologist just suggested that I undergo “the bubble test” to check for the hole. But I didn’t understand why I would have a hole in my heart in the first place! And why no other symptoms besides migraines? Last year I paid the $410 (not covered by insurance) to see if I had the PFO in my heart. I didn’t. It was good to rule one more thing out though. I had the PFO closure procedure done 11 1/2 months ago (June 2007). I have been migraine free since the procedure. Prior to the surgery I was suffering from one or more migraines per week, along with related TIA’s (trans ischemic attacks – aka mini-strokes). I continue to have severe hormone-related headaches once a month but the traditional migraines and TIA’s have completely stopped. For anyone suffering from severe, quality-of-life impacting migraines I strongly recommend you follow and research the PFO option. I had no side effects or difficulties as a result of the PFO closure and had a quick and easy out patient recovery period following the initial procedure. I had a TEE performed yesterday that confirmed my PFO that was discovered 10 years ago when I started to have mini-stroke migraines. I was advised by the physician yesterday to have a closure performed. I am only 33 years old and pretty freaked out about this. All other websites that I have read on this procedure have been very promising and reading the above message from Zara makes me feel better about it. I am 1 yr post closure, and while the procedure has not rid me of all my migraines (I am still on the same pre-surgery preventative regimen and continue to get very predictable menstrual migraines), I have been able to track an approximately 50% reduction in my number of headache days per month. And, since I used to suffer 12-14 days per month, the surgery has brought welcome relief with no negative side effects. Who can say that about most prophylactic drug treatments? I’m scheduled for the Escape trial at the end of this month and am just hanging on by my fingernails, hoping I get the PFO closure and that it helps. I find I always get severe migraines with any kind of exercise, so I’ve been pretty sedentary, and that’s causing an overall decline in health that is making me age very quickly. Despite the negative study results, what Robert, Zara, and Laura say encourage me. Please don’t stop the blog now! I’m really hoping for a breakthrough. I am desperate for help with my migraines. My problems first started out as rare headaches until I had a syncope spell 10 years ago when I was 25. I have had several episodes of syncope along with heart palpatitations and chest pain over the past several years. Recently, my migraines have become unbearable and almost daily. I feel like none of the doctors I have seen care or feel like I truly have a problem. I was very interested in this study. I wonder if this may be my problem. I participated in the ESCAPE trial and believe I was one of the lucky people to get a device. I went from 11-14 migraines a month to zero. Migraines were ruining my life and some of the side effects from prophylactics that I experienced were life threatening. I know one other person who had a PFO closed after a TIA and her migraines also disappeared. While admittedly the MIST trial had some complications, judgment shouldn’t be passed until ESCAPE and other notable trials publish their results. This technology greatly improves quality of life and migraine sufferers deserve the opportunity to access it before having a stroke or TIA. I was diagnosed with Migraine headaches when I was a child. I am currently 66 years old. I thought that I had “out grown” the Migraines at about the age of 50. In the last year and a half to two years, headaches, a little milder than most of the headaches I have had my lifetime, have returned. They last for weeks at a time and no medication seems to help. In Oct 07 I had an Echo Cardiogram and was told that my Aortic Valve had to be replaced. A Catherization confirmed the necessity of the valve replacement and I was told that my arteries were fine and needed no attention. The Aortic Valve was replaced in Nov 07. If I have a PFO would and/or should the surgeon have been able to see it during the surgery and told me about it after the surgery? I have not discussed this with my doctor as I have just learned about PFO yesterday and my understanding is that a lot of family physicians are not aware of this condition, do not run tests for PFO or that PFO’s are associated with migraines. I will check further but would appreciate any information I should ask my doctor. I’m not sure if your surgeon would have been able to see it. I would guess not, but don’t know for sure. I’d definitely ask your doctor about it. If you have no luck, you may want to talk to a headache specialist about it. I am being scheduled for an echo cardiogram myself specifically to check for a PFO (advised by my neurologist, who is truly amazing), so I’m guessing if they were checking the overall condition of your heart, they would have caught it. Just came upon this blog and feel need to share. I had a PFO Closure done with Amplatzer Device in November of 2007. I feel as though the physicians who diagnosed me and inserted the device gave me my life back. I have dramatic improvement in not only my migraines but my quality of life in general. Just this week, my 31 year daughter underwent a bubble echo and she has a PFO that is larger than mine. She has aura migraines, dizziness, some vague shortness of breath and sporadic episodes of varying degrees of vision loss, etc. In July, she had an episode where she had complete vision loss for 1 to 2 minutes. She is going to undergo PFO closure with the amplatzer occluder in October. I recommend for anyone with a PFO and significant problems to google PFO closure and read about the different devices. Do your research. I extensively researched PFOs, closures and the different devices before undergoing the procedure. (Be aware however, that this is a problem that has been undertreated and primarily unrecognized in adults until recently so there are not much out there as far as long term studies go and no clear cut “agreed upon by all” treatment). What I discovered is that there seems to be a significant difference in results depending upon the devices used. I’m not saying that is a fact–just what I noted with what I read. I found from the blogs I read, the articles and studies that patients undergoing closure with Amplatzer Occluder showed better results as a whole (again, just my opinion–I suggest you do your own research) and luckily that is all my physicians and hospital use. They also are involved in one of the migraine trials, but I did not have my closure as part of the trial. My symptoms and PFO size were such that I qualified for FDA approved closure outside of a trial. I was 57 years old at the time. I had a history of migraines with auras and weird neurological events going all the way back to my 20s–which the neurologists told me were migraine symptoms. As I grew older, my symptoms became more pronounced and serious–but were still attributed to migraines. For the 5 years prior to my closure, my stamina and energy level were terrible–affecting all areas of my life. I saw all kinds of different specialists–some who blamed migraines, some blamed fibro-myalgia and some just considered me a hysterical post-menopausal female. I saw a cardiologist for another issue and he followed a hunch and ordered a bubble echo. Finally, I had a diagnosis. The procedure was not bad at all and my recovery was quick. One week after the closure (with my doctors permission) I was at the mall Christmas shopping and I had enough energy to do so. It has now been almost a year and I feel like a new person. I’ve had no adverse affects and consider myself very lucky that I didn’t have a stroke and that it was diagnosed and closed. (the cardiologist said I’d been having TIAs–mini strokes–since my 20s). I haven’t had any TIAs since the closure. I’ve had an occasional short-lived and non-severe headache since closure, but I can usually attribute it to a specific cause. My headaches are between 80 to 90% improved. As far as I’m concerned the availability of PFO closure in the cath lab is a miracle that made a new person out of me. Good luck to anyone out there struggling with this issue. I need to ask for some help. I suffer from migraines that are manageable by medication however my sister is not as lucky. She has migraines approx 15-20 days a month and on the days she is not suffering she is trying to recover. We have had her at the migraine clinic in MI twice with out any relief (we live in Florida) and she is now seeing another new neurologist. He has done the botox on her, nerve blocks, self administered injections of Demerol all with no relief. It has been over a month with pain daily she ended up in the hospital (again) and was admitted for two days they started IV steroids on her and she had an adverse reaction and they had to stop. Now she is home and we don’t know what to try next. We keep asking the Dr’s to check for the PFO and they will not citing that it is too rare. How did you get your doctors to order the tests? I hate to see her like this and I need to help her. Any direction you can point me in is greatly appreciated. I’m not sure what to tell you. I’ve never been tested for it. I think seeing a cardiologist would be your best bet. I was also found to have a PFO, about a year after having a TIA that caused me to lose control of the right side of my body for about 10 minutes. They ran every test but that one, couldn’t find any problem with my arteries, heart, etc. I was the one who brought up the PFO possibility (being a migraine sufferer most of my life as well). My neuro didn’t want to do the test until my adult daughter had it done & they found that she had a PFO. My neuro then ordered it, and I had one of those “whoa” kind of PFO’s – pretty much leaking all the time. I didn’t qualify for studies & I didn’t qualify for closure in the US – I went to Germany & had mine closed by an expert known world-wide. It was amazingly easy to become his patient, the procedure went like clockwork, and I rode the subway back to my hotel the same day, and did some light sight-seeing the next. I also got my energy back. Before the closure, I was unable to do anything like an aerobics class because my heart rate would get too high with almost no exertion. I can now exercise again, my pulse accelerates at a normal rate & recovers at a normal rate. If your doctor won’t have the bubble echo done, find one who will. It isn’t a tricky test to do. If I had severe migraines & frequent, I would even pay for it out of pocket if I had to, just to make sure. I can tell you that my neurologist was NOT the one who even gave one thought to the possibility of a PFO (and he is really a very competent Dr.). Mine was discovered by a cardiologist. I can’t say that I’m qualified to give you advice but I can tell you what I’d do if it was my sister (or myself for that matter knowing what I know now). I would get on google and search for a Research Medical Center that is closest to you doing Migraine/PFO clinical trials, click on contact and call their person listed (usually is a research nurse). That person should be able to tell you per telephone if she would be eligible for screening for the trial. As I understand it, if she qualifieds for screening for the clinical trial, they would do a bubble echo (which is what she needs to diagnose or rule out a PFO). They would review all aspects of the trial with her and she could decide if she wants to join the trial or not. But, getting a bubble echo is what she really needs because that will determine if she has a PFO. You don’t need a physician to refer you to these clinical trials and I’m fairly sure any care or testing associated with it is without charge. If none of the trials are close enough for her to travel to, then I’d look for a large university medical center and contact their cardiology department to ask if they have a cardiologist who specializes in PFOs and if they do bubble echos. Most of the time, you can self referral (if your insurance allows it) to university medical centers. Remember that a regular echo will not diagnose a PFO, it needs to be a Bubble Echo. I had a pfo closure in February, never suffered any migrianes, but had a major stroke 6 yrs ago aged 40 that baffled the experts who said there was nothing wrong and I was just imagining things, even described as hysterical stroke syndrome!!! but no one had checked my heart and it wasn’t discovered unil I’d had 3 tia’s in one week,and a locum doctor admitted me into hospital and routine checks found the large hole. Since the op I’ve now got migraine, and there’s a small leak, I had a bubble test 2 weeks ago and been terrible since then, loss of vision, sickness and generally feeling awful,however the pfo closure has brought me a whole new quality of life as before I was constantly tired even tho the surgeon was adamant this wasn’t the reason why I was tired, I can now run for 3 minutes without gasping for breath. Any idea’as why I’m now suffering and wasn’t before ? Wow, that’s scary. I unfortunately don’t have any ideas about why you’re having trouble after the surgery. Perhaps a neurologist could help? I was really interested in your posting. I see you also have an adult daughter with a PFO. My cardiologist is really interested in the different aspects he is discovering with his PFO patients. Basically, as I understand it, there has been so little attention given to PFOs being a serious medical problems among adults that essentially no research addresses the issues. I am going to share with him that another person on this Blog also has an adult daughter with a PFO since we just discovered one of my three daughters do. The other two don’t have any of the symptoms or don’t have migraines so we’re not screening them. I’m also interested to know where you live. Both my daughter and I also had the “whoa” PFOs that leaked all the time. And like you, I didn’t have mine for Migraines, but it sure has been a welcome relief. Gosh, I don’t know what to say to you. You keep saying surgeon. How was your PFO closed? Cath lab or surgery? I know that the information I read says that in some cases (especially when the PFO is really large and depending upon any other problems in the area of the PFO) that small amount of leakage may still occur. I am really puzzled as to why you should have all of those symptoms after a bubble echo. I know that during the first part of my procedure in the cath lab the cardiologist inserted something called ICE (intracardiac echo) probe. Basically it is a small catheter with a tiny echo probe on it. This probe was left in for the entire procedure so they could display computer echo images from inside my heart throughout the procedure (which of interest, I was awake and watching). But, before he began the closure, he used the ICE to look inside my heart to make sure I didn’t have additional smaller holes that didn’t show up on the bubble echo. He explained to me that sometimes, especially when the PFO is large, there may be other tiny holes or congenital abnormalities that they need to know about to determine the success of closing the PFO with a device in the cath lab. He also told me that sometime the heart muscle around the PFO can be “floppy” and which makes closure with a device more tricky. The echo probe inside my heart ruled out those problems and he proceeded with my procedure. Please understand that I am in no way suggesting that this is your problem or pertains to you, but am merely sharing with you what I was told as some of the things that could be problematic or could either prevent or make cath lab closure less effective. But, if it was me, I would be asking for someone to give me an explanation as to what they think is happening. well, this is new to me. I thought I took and did everything possible for the migraines I have suffered from for forty years. I was just recently hospitalized for an acute migraine that lasted over two weeks. My Neurologist was going to do an IV called, I believe, a DHE to break the cycle of the migraine. Before this drug can be administered an EKG has to be done. Well, the EKG was done and came back abnormal so the drug was not given to me. Due to the abnormal EKG a cardiologist was brought in and I remained in the hospital to have an ultrasound of my heart, a stress test and another EKG. There was nothing conclusive from the tests but due to their initial findings I am not inclined to have the IV drug. After having read this website, it makes me wonder if they would have found this PFO without looking for it and if after all those tests it might just be my problem. I find most of these testimonials to be very interesting and uplifting. Anything that would give me just a couple days of relief a week would be worth the try. Thanks for the information; I will be taking this to my Neurologist tomorrow to see what his reaction is. I wish all my fellow migraneurs the best in the future. It’s a tough life, but there’s always a chance!!!!! Perhaps someone can help with my son’s situation.He is 18 years old and has suffered from hemapalegic and daily migraines since he was 9 years old.We have been to several neuroligists including a noted headache DR. at UC medical center in San Francisco.Every Dr. claims that his problem is genetic, and he will most likely out grow the problem. In the meantime he has been in a state of daily headache for 9 years. In addition, the hemapalegic episodes (1/2 of his body goes numb)are continuing at the rate of 2-3 tmes per week.His Dr.’s have tried a dozen medication to no avail.We have done MRI’s ,CAT scans, as well as sleep deprived EEG.No brain tumors etc. were found.He is currently taking serious pain meds and it provides minimal relief.We are desperate to find a solution. He is an extremely bright kid,but has problems completing college courses since he misses so much class.Could a PFO be the problem? We live in central California and my son is currently in Santa Fe New Mexico trying to attend college.PLEASE ANY HELP WOULD BE APPRECIATED !!!! I qualified for the Escape Study. and they cancelled it last week, 7 days prior to my scheduled surgery. so now I’m going to head to a neurologist and start trying to get this done without being in a study. I get migraines because of weather pressure changes, exercise (leading to an unhealthier lifestyle) and overheating when trying to do just about anything! Definitely get your son tested for PFO by transthoracic echo with bubble study or Transcranial Doppler. I had hemiplegic migraines as well. I have not had a single migraine since the closure procedure. My quality of life has improved. My only regret is the procedure not being available when I was younger. After 15+ years of dealing with majors headaches and migraines a doctor finally suggested that I have an MRI of my brain. The MRI resulted in several abnormal “flare spots” on my brain. I was referred to a neurologist who assured me that I didn’t have a brain tumor. He also explained to me that it wasn’t uncommon for people who suffered from such bad headaches to have these “flare spots” on their brains. 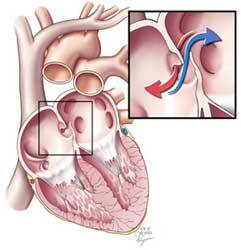 However, he wanted to rule out a PFO (Patent Foramen Ovale) so he referred me to a cardiologist who performed a T.E.E. (TransEsopohogeal Echocardiogram). The test showed that I did indeed have the PFO. He then referred me to another cardiologist who would decide whether or not closing the PFO would be necessary. He made it clear to me that he wasn’t interested in my case or doing the procedure to close the PFO just based on the migraine history. It wasn’t until he reviewed the films of my MRI and realized that there was obviously something more going on and that he would reccommend the procedure for me. I am now waiting for insurance authoriztion and a scheduled surgery date. I only pray that I am among those of you who did have a marked decrease in the number of headaches/migraines that you had after the hole was closed. The doctor said that it was about a 50% chance that the headaches would possibly get better. It’s definitely worth that for me!!! Your story seems very similar to mine Jacquelyn. I have been suffering from migraines for 24 yrs. I get them almost strictly from physical exertion. I get them sporadically after soccer or running or other physical activities; mostly involving a quick burst of energy. I get an aura about 15min before the outset of the real pain. Two years ago my doctor prescribed a beta-blocker to help prevent them and it seemed to work pretty well. It reduced the frequency of attacks considerably but the beta blocker also caused me to kinda feel sluggish and made it harder to get my heart rate up during a workout. BUT,… Based on what i’ve been reading and my own theories of Migraines,…and the type of trigger that i have for my migraines, i’m beginning to think that i might have a PFO so i am in the process of scheduling an appointment with the only Cardiologist at the University of Tennessee that as experience doing the closure procedure to first see if i even have a PFO and if it will help if he closed it. Holy cow, I am 18 years old and have been suffering from headaches since I was 13. In the past year or so, the headaches have transformed into dibilitating migraines with naseau, dizziness, slight aura, and muscle pains. I’ve been on three different daily meds, as well as two different “emergency” meds. I’ve had an MRI of my brain and neck, and everything looks fine. I’ve tried massages, chiropractor, as well as currently trying physical therapy. My neurologist is amazing and I will definitely be printing off some of this for him. I also end up having to get tordol and fenergin (sp?) shots at least once a month. It would be so amazing to finally find a solution. I had a PFO Closure June of this year due to having had a stroke at 43 and having had severe migraines all my life. Have been migraine free for almost 6 months. Felt the need to write as I too suffer from migraines for what has been most of my life and was diagnosed with a large PFO (5/5 at rest – 5/5+ with pressure changes in my heart when straining/bearing down). In December 2007 – I started a daily migraine and haven’t had a day of relief since. I have around the clock auras and several days a week of debilitating pain. On December 1st of this year, my PFO was closed and while I am still healing – I have great hope and have already noticed a decrease in my aura symptoms with the device (while made of porous material) in place. To begin my story and also my advice for others…I was told by more than one doctor that I trust and love that my PFO could not be causing my migraines and aura symptoms. I believed them for a long time. They aren’t bad doctors and it is true that there isn’t good solid research that substantiates PFO closure as a viable treatment for migraines. Compelling research, but not “FDA approved treatment” research. I also feel lucky that I live in Seattle where there are many neurologists and interventional cardiologists working together to treat migraines as well as other potential neuro-cardio health problems like stokes. My primary care physician and my neurologist first tried all the drug and naturopathic remedies under the sun. I’ve tried over 30 drugs and nothing helped. Most of the time – drugs make my symptoms much worse. From my experience, people need to go through this trial and error, as painful as it might be, because insurance companies don’t pay for PFO closure for migraine treatment unless you’ve exhausted your non-invasive options. After not having drug success and because of the size of my PFO – my docs referred me to one of their interventional cardio colleges who helped propel the discussion of PFO closure for treatment of my migraines. DON’T GIVE UP. Find someone who has experience closing PFO’s as treatment for migraine and preferably a cardiologist that has good working relationships with neurologists (specifically headache specialists). You might have to wait. I waited over six months this last year to get in to see the right folks. My cardiologists is one of the best in Seattle and even in this big city full of cutting edge medical research and breakthroughs – they had only closed 6 (I guess now 7 with my procedure complete) PFO’s for migraine treatment in the history of the treatment option. They’ve closed more through studies, but I didn’t qualify for any study because of the frequency of my migraines. PFO closure for migraine treatment is controversial. As many posts before me note – they had PFO closures for TIA’s or strokes and migraine prevention was a secondary symptom or benefit from the procedure. Be your own advocate and document everything. The best thing I’ve done for myself is keep really good medical records. Tracking symptoms, frequencies, drugs tried and subsequent reactions, impacts on life, etc. made all the difference for me. I could show easily and concisely what I experience and how my quality of life was impacted. I need to wait out the time that it takes for heart tissue to grow over the implanted closure device to get full benefit, but hopefully over the next three months, I can start getting my life back. I’m m36 and have suffered with Migraine with Aura since the Age of 8 so 28 years, last year my migraines suddenly became very much worse to the point of the aura symptoms appearing 5 times in one day and being admitted to hospital as they thought I was having a stroke. I joined the PRIMA trial early last year and had the closure on the 8th Jan. So its only a week since the closure, but everything feels fine and I have recovered well. a point to note, my migraines stopped occuring 2 weeks before the surgery, when the trial put me on daily disprin (75mg) and daily Clopidogril (75mg). The surgeon who carried out my closure, did say that it might be an idea to carry out another trial using clopidogril only with no closure. Anyway, message to all, it seems at last there is hope so hang on in there. Thank you for sharing your stories. I am a 37 year old woman, mother (who works full time) of 2 small children (recently diagnosed with MS, currently in remission) and just last week confirmed through TEE I have PFO. I have suffered from migraines (and headaches) with and without aura my entire life. I have also had these “episodes” a few times a year that no doctor has been able to diagnose (ruled out seizure & syncope) which I believe are TIA’s (followed by one sided temporary numbess or confusion). I also have always had exercise intolerance, overheat easily and intermittent chest pain and palpitations. I also have insulin resistence (PCOS) and prediabetes to further complicate my health picture (some days I feel like a mess). I strive to be very healthy and take good care of myself, despite my many health challenges. I have a disease that is not curable (MS) and one condition that potentially is (PFO). I am leaning toward taking the risks associated with closure but have a lot to consider, especially if I go against my doctors advice (and find that my health insurance will see this as elective or preventative and not cover). I can’t help but think in 10 years there will be much more data to show the connection between PFO and migraines as well as other health challenges. It is scary to be a guinea pig, but helpful to hear from those of you who have had relief and know that it is worth taking the chance for quality of life … Thank you. THANK YOU everyone for sharing your stories! I am 27 years old and had my first migraine with aura 9 years ago, which slowly progressed to a chronic daily headache of varying degrees. I haven’t had a completely pain-free day for over 5 years. My PFO was discovered recently and I’m most likely going to have it closed, though I’m a bit nervous about it. My doc gave me a list of things that could go wrong but couldn’t give me any idea about my odds of relief. I stumbled across this forum yesterday while trying to find an update on the current status of the different PFO closure studies. I have been part of the PREMIUM study and underwent the cardiac cath procedure in Dec.2006. You find out at the one year follow-up which group you were placed in-the closure group or the “sham” group. Unfortunately, my PFO was not closed with the device. Which did not surprise myself or the doctors involved, as I did not experience any difference in my headache pattern whatsoever. I’m the mother of 4 children and started suffering migraines over 20 years ago. From what I can pinpoint, it was probably during my first pregnancy. Like some of you I’ve read about on this forum, two definite triggers for me are exercise and hot weather-conditions that increase my heart rate. The theory is that the substances usually filtered out of the blood by the lungs before reaching the brain are not totally filtered out if you have a PFO and are allowed to reach the brain, sometimes triggering migraine headaches. This made total sense to me, as I am a nurse and have a medical background. I never knew I had a PFO until 4 or 5 years ago when I suddenly developed tachycardia episodes and underwent some cardiac testing. It turns out I have the largest kind of PFO (Grade 5, I believe), so when the PREMIUM study came along, I was the ideal candidate (one of the criteria is a Grade 5 PFO). Needless to say, I was hoping and praying to be placed in the closure group. But it just wasn’t meant to be, I guess. My question for some of you is- how did you qualify to have your PFO closed for the treatment of migraines without any history of TIA or stroke? Were you able to get your health insurance to pay for the procedure? Do you know of any specific doctor who will close a PFO for this reason alone? I live in Minnesota, but would be interested in hearing of anyone who might make this a reality for me. I truly believe this could be the answer in my case and would do anything to finally feel healthy again. I have tried so many different treatments, but the headaches have only become more frequent over the years, to the point where I always have at least a low-grade migraine everyday with several severe headaches every week. Fortunately, I have a fairly high tolerance for pain and have always been determined to give my kids a “normal” life with their mom as much as possible. So I have done a lot of “suffering in-silence”. I would be grateful for any leads you could offer! recover from them, and constantly dreading when the next Aura begins, and I am down again. and taken almost all preventives available and dealt with all kinds of side effects, with no help. Hi all! I did have my PFO closed in April, and I went for 2 months with no migraines. The daily headache has been unchanged the whole time, and I was having an aura without migraine every 10 days or so, which never happens to me. I always have a migraine after an aura. So I got pretty excited that maybe I would be migraine-free, but then around the 2 month mark the migraines returned and are now back to normal. I’m pretty disappointed but hopefully I will have changes in time. In 3 months I will be able to stop taking the plavix, and who knows, maybe that will help. Sorry to hear you didn’t get the device, Shelley. I was very fortunate to be referred to a cardiologist (in Michigan) who has herself had a PFO closure and has no migraines now. She wouldn’t give me any promise of success but was adamant that it was worth a try. I have no history of TIA or stroke, only migraine with aura. And I have tried everything that anyone can think of. My headaches are quite debilitating, so my low income qualifies me for state medical coverage. My doc said they would most likely pay for it on the hopes that I would be able to work again, and they did. What a challenge it must be for you to hide your headaches. I spend plenty of time doing that but I don’t have a family to take care of! I would like to some day, but I couldn’t manage it with this pain. Good luck to you, I hope you find a doctor that will close your PFO. Wow, this is so interesting. I’ve never heard of any of this until last night on Discovery Health. I too have suffered from migraines since age 11. Is anyone familiar with doctors in the Orlando area that work with these procedures? I had total debilitating migraines almost everyday for 2 years. I tried tons of different drugs that the neurologist had me on. So with horrendous side effects like schizophrenia. Found articles on migraines and PFOs and went to the cardiologist. Have now been migraine free for 7 weeks. Some results were instantaneous. Like my pupils, part of why I couldn’t stand any light at all was because my pupils were constantly oscillating. That had stopped by the time I came out of surgery. I know that this procedure does not help 100% of migraine suffers, but for those that it does IT IS A MIRACLE! I have chronic dizziness lightheadness with migraines all meds have been tried does the hole in the heart have a link between the two? I wonder if the only thing wrong with me was fixed the PFo the dizziness would go away? Wow, lots of information in here! I just found out today that I have a PFO thing going on while under going a stress test. The Dr doing the test heard a murmur and then when he heard I have migraines did the “bubble test” and found a hole. I’ve been having aura migraines for the last 30 years. They are kind of managed- I have to take 80mg of blood pressure medication to help block them and the maximum amount of feverfew allowed, and when I do get the break through migraine slam imitrex nausea meds and painkillers. I like the thought of not having to take blood pressure meds that leave always tired and living in fear of the breakthrough migraines that seem to come once every month or two and leave me a mess for 24 hours, although after reading the stories above I realize I don’t have it nearly as bad as a lot of folks. My heart goes out to migraine sufferers, it’s a special hell that people who never had one will never understand! I just had my pfo closed 2 weeks ago, and my migraines have gotten worse too! I have had an aura migraine every day since. I am very frustrated and need some hope. I hear that it gets better after 3 months…has anyone else had this happen to them? I had my pfo closed on January 14, 2009. I had suffered 2 strokes in the past 3 years and have had migraines with aura since I was 18. (I am now 46) I also have protien C deficiency, a blood disorder that causes my blood to clot a lot more than normal. Anyway, the procedure went well, and although I am headache free I have auras quite a lot and just in the past week and a half have had dizziness about every other day. Anyone else have diziness post op?? I will be contacting my doctor on Monday! Actually my pfo was closed January 2010!!! Not 2009. Sorry! I had a PFO closure on May 4, 2009. Before that I had extreme headaches almost everyday, that grew especially severe in the last 4 years. I went through all the standard medications for migraines, but nothing worked. I was told that I had had “a few small strokes” as well. I found the link between PFO and migraines/strokes on my own without the aid of my neurologist, was tested, and within the month had the procedure to close my PFO. Now, almost a year later, I feel like a new person. Rarely do I experience any kind of head pain – at all! AMAZING! I just returned from a visit at the local Headache Clinic/Hospital where the Dr. recommended my involvement in this study. (in Canada – Prima Clinical Trial) I do not even know yet if I have a PFO, but in the event I do and qualify for the procedure – I have a lot of questions….and concerns. I see a great mixture of good and bad feedback from those who have had the PFO closure done, and now I am even more confused and weary of whether or not to consider it. I am 36 years old and I have experienced migraines with aura for the past 15 years. They started after a severe car accident where I had a head injury. I had never had a headache before then. Now, the headaches are anywhere from mild/moderate to full blown attacks where I vomit, have trouble speaking and basically cannot function. I have tried just about everything that is out there – drug and non-drug, but to no avail. I am at the point where I thought I would try ANYTHING to find relief, but after having this presented to me, I am scared to say the least – firstly, scared about the procedure itself, worried about the possible risks and also worried that even if the procedure itself goes well, that it will either not help, or worse yet, make my migraines even worse. These fears have been confirmed by some of your comments. The idea of implanting something in my heart (which to my knowledge, is working just fine) is concerning to me, especially when I read that some of the risks include heart failure or tearing of the heart or throat during the procedure. I guess, I’m still not sure what to do, so if there is anyone that can provide more info or make this decision a little bit easier for me, I would greatly appreciate it!! Hi everyone. I didn’t realize there was new posts! I guess I haven’t checked for a while. I sure wish I could report a miracle, but I have had no luck with the headaches 1 year post-closure. I haven’t had an aura for a long time so maybe that’s a thing of the past, but the daily headache or migraine, whatever it is (which ranges from a 3 to a 10 ont he pain scale) is actually generally worse. What a disappointment, I never imagined they would get worse and I can’t imagine how that would be. Maybe it’s unrelated and I don’t want to scare anyone out of doing what’s best for them. The closure has helped a lot of people. But surely not me. I would like to stop taking the daily aspirin in case I have a little allergy or something that might be affecting the headaches but I’d have to ask the doc first, she said I’d take it forever. It seems like my triptans don’t work as well anymore, maybe from the aspirin? Joyce, you’ve probably already figured out that you have to go to a cardiologist for a cardiac echo. They do a bubble test to see if the bubbles move from one chamber to another. Then I had a trans-esophogeal echo to investigate further. FOr that they put a probe down your esophagus to take an ultrasound from the inside. I’m not sure if it’s difficult to get a doc to do an echo without some kind of symptom, like stroke. I had the test after episodes of rapid heart rate. Good luck with the headaches, I know how you feel. It’s awful. Shelley: my cardiologist is Dr. Mayra Guerrero with Henry Ford Hospital. She is very kind and she had the closure herself and is migraine free. It took years for hers to disappear, and they were only occasional. She had the closure because of numbness in her hands, a bad thing for a surgeon! Gokhan: I’m assuming your wife is on blood thinners? I had to take them so blood didn’t clot around the patch and cause TIAs (mini strokes). Make sure you talk to the doc. Jamie: How are you doing? My headaches actually got a little better for a while right after closure but then got worse. I had tons of auras without migraine right after too (even hours after the closure), that’s never happened before. No auras for a long time now, just migraines. Cathy: I’ve had dizziness too. I blame it on the blood thinners. Kim: I know how you feel. It was a really hard decision for me and very scary! But my headaches are 24/7 so I had to try it. If I didn’t I would have wondered forever. There’s no doubt it’s not a good decision to have to make. When I asked my doc about whether the headaches could get worse she said it’s very unlikely. I wish I could give you an answer! I probably wouldn’t have done it for one or 2 migraines a month (and my doc wouldn’t have had recommended it) but there’s also that looming stroke danger. Pros and cons! Kim, I had my PFO closed just before I turned 36. For me, finding out that I had a hole in my heart, and that it could be a cause for my headaches and strokes was amazing. In a million years, if someone had said to me that finding out you have a hole in your heart was a good thing, I would have laughed at them. However, when you’re at the last straw and you can no longer function in a normal way because you are always bombarded with severe head pain – daily, finding a PFO was like being a six-year-old and waiting for birthdays and christmas all in one. It was finally an answer that might work at relieving the pain. And, it worked! Unfortunately, in your case, you need to find out if you have a PFO first – you can’t fix it if it’s not already broken. I had my PFO closed in 2006 and for a while my migraines got a lot worse!!! It was probably 4 – 6 weeks before I saw any improvement at all. And then all was fantastic for about 2 years – I was completely migraine free which was absolutely brilliant after living with migraines with aura for years. Sadly my joy has been short lived as for the last two years I have been suffering from a constant daily headache which has now turned into a migraine and I have now started to suffer from migraine with aura again. It seems that the PFO closure has not been the miracle that it first seemed to be. I have trawled the internet to try and find information about the long term side effects of this operation but there is nothing. Does anyone know what the long term effects are? Can the proceedure have long term negative effects? Could my daily headache and new migraines be linked to the device used to close my PFO? My doctor is not terribly helpful and neither is my neurologist so I feel as though I am at a deadend – left in constant pain. Sharon, I probably don’t know any more than you but my cardiologist did say a couple of rare possibilities are that clots can form around the patch, or that it’s possible to develop an allergy to nickel (though I think you would notice that from other sources like jeans snaps). I too wonder whether I’m worse off after the closure, but my guess is it’s a coincidence. Are you taking blood thinners? I took plavix for 6 months with a full-strength aspirin, now I’m just taking the aspirin. I tried to stop taking it recently and suddenly I began getting migraine with aura EVERY DAY. It’s never been that bad before. I am 17 mos post-op. Started the aspirin again and the headache went back to normal (which is a daily headache from a 3-10) and haven’t had another aura since. So for me some blood thinning is essential. Have you heard about the DHE IV infusion? It’s an anti-seizure med. I’m thinking that’s my next course of action, though I’m dreading 5 days in the hospital. Will be worth it if it helps though. Research looks good and doctors have been using it for a long time. Have to take Depakote for 6 weeks first. Good luck to you. I know how you feel. Hi Christy. Thanks for the advice. I am currently taking an anti-seizure medication and have been for about 18 months – two years and that has not made any difference! Although I have not enquired about the IV infusion – I will ask next appointment. They have talked about the possibility of looking into whether the PFO closure was effective but do not ‘want to go there’ as they are not sure what they will do if they find out that there is still a hole!!! I’m seeing my neurologist again next month to see if there is anything else they can do but I am not holding out much hope. It seems as though they are quite happy to leave people in constant daily pain! Still there are people worse off them me so I suppose I shouldn’t complain! I am 38yrs. old and just found out that I have a PFO. I’ve been having migraines since I was 8yrs. old, but got worse as I’m getting older. God willing I will have this hole closed when I see my cardiologist in April. Any advice I would love to hear! So tired of living like this which I’m sure all of ya’ll can understand!!! I have had migraines for most of my life, but was found to have a PFO when I had a stroke. In hindsight, I also had a stroke 30 years ago when in my 20’s. I was told that the numbness then was likely related to migraine activity, but last fall the event showed up as an acute stroke on MRI. Two old strokes were also noted on that MRI. I am grateful that I have no permanent disability. Since my PFO closure, I have had only a couple of minor headaches, no auras and certainly no disabling headaches with nausea and vomiting. I think if I avoid some triggers, especially wine, I will be migraine free. My PFO was closed with an Amplatz device. I was back at work within a week, and am working up to my pre-procedure exercise levels. Knowing what I know now, I would recommend a bubble study for anyone having severe migraines. Closure of a PFO may benefit the migraines, but even more importantly, it may prevent a disabling stroke. Thank you to all those who have contributed personal experience stories. In Australia our health care system is different. After suffering migraines for 40 years I am having a TOE which I understand is a TEE as well as a test where a probe is introduced through a vein in the groin. My mother died at 51 as a result of medication eating away the lining of her stomack. That med was primarily for migraines that were ongoing. My memories of her were bedridden with the doctor visiting our home daily to attend. How sad that PFO was not know about in her days. In a funny kind of way I am looking forward to the possibility of a hole in my heart, it would answer a lot of health questions. I am post TIA an Strokes with some disabilities. Hi! I’m from the UK and took part in the original MIST TRIAL here several years ago, as I’ve suffered with Migraines with Aura since I was 21 (now 58), so I was interested in anything that may stop or reduce them! I was checked out and I did have a PFO, and I went on to take part in the trial, and it turned out I was one of the ‘Sham’ patients (so hadn’t had the PFO closed) but of course it’s several months before you find this out, and you take the Aspirin & Plavix just as those who had the procedure did. Anyway….long story short…I was offered the procedure at the end of the Trial, and went for it because of the possibility it would prevent or lessen the possibility of a Stroke. After I’d had it, initially my Migraines were less, but then gradually I started to get them just as often. What I’m curious about and the reason I’m posting this is I’ve had chest pains over the past few years, which started probably a year or so after the STARFLEX was fitted. It’s a bit like the type of pain you get in your side when you have a ‘stitch’. It’s mainly after walking for a short while and I get quite out of breath.The pain radiates right through to my shoulders and back. I don’t smoke, am very slim, and wonder if its related to the STARFLEX. I am just waiting for a hospital appointment, but want any anecdotal evidence to take with me as I’ve seen on other forums people mentioning chest pains. Anybody who can help it’ll be much appreciated! I wish I could help, but haven’t heard of that problem before. Best of luck with your appointment. Please let us know what you learn. I had a stroke 10 months ago. I have a pfo and my doctor stated the general thoughts about whether the pfo caused the stroke was unclear but on some cases it maybe the cause if there is nothing else . I had read on the Internet about what the current thinking is but there is do much information about pfo. My thoughts are that it’s important that if a person has had a stroke they do everything to make sure they don’t have another. There is a risk that a clot can move from your leg and are not filtered in the lungs and move to the heart then brain. In the UK the operation is free but various doctors have to confirm it’s necessary before the nhs will carry out the procedure due to the cost. I may be given the treatment. If not in the back of my mind I will be wondering when I will get another stroke. I am 45 and had high blood pressure before the stroke. I will do another update . KSK, best of luck in finding a treatment. Please do let us know how it goes. I am from Australia. I am 37. I have had a small stroke. I have no other risk factors except my pfo. I have a positive bubble study, left to right shunting and mobile septum. Experts here are divided. Cardiologist s will close them. I am nervous about the device being in place for life without great long term evidence of recurrent stroke reduction. Other doctors say i should be on aspirin and see if another stroke comes. I have a small migrane with small aura four times a year. I am now on aspirin and wonder if i should wait for another episode or have the operation. Any advice please?